Last weekend, we were invited by Australian chef Chris Jordan, formerly at the acclaimed Flying Fish & 4fourteen restaurants in Sydney, to his pop up restaurant ‘Tasting Room’. Tasting Room is the first venture by Chris, and with it he intends to bring together a variety of themed dinners that draw inspiration from a mixture of local establishments ranging from chicken shops to cocktail lounges. Tasting Room is located at Startisans, an indoor food market on Shelton Street in Covent Garden that showcases artisan food producers at lunchtime on weekdays. As his home is a local food market, he intends to use ingredients from nearby farmers’ markets and small businesses. The venue will hold a large communal table where diners are encouraged to bring their own drinks and which will also facilitate a sharing dining experience. Six ‘tasting room’ events with be held a month with regularly changing menus. Future events will look to collaborate with pop-up chefs from Michelin-star backgrounds. Last weekend’s menu drew upon teas by Yumcha, a teashop with locations around London including Soho. The starter was a ‘Caramel Sweetheart’, cauliflower and scallop, a complex dish consisting of beautifully seared scallops and fresh sweet scallop ceviche. Accompanying the scallop was a lovey cauliflower puree flavoured with ‘Caramel Sweetheart’, a white chocolate and caramel fudge tea, some tasty cauliflower cous cous and shaved cauliflower. The latter two elements completed the dish nicely by adding crunchiness and texture. This was a wonderful, skillfully executed plate of food. 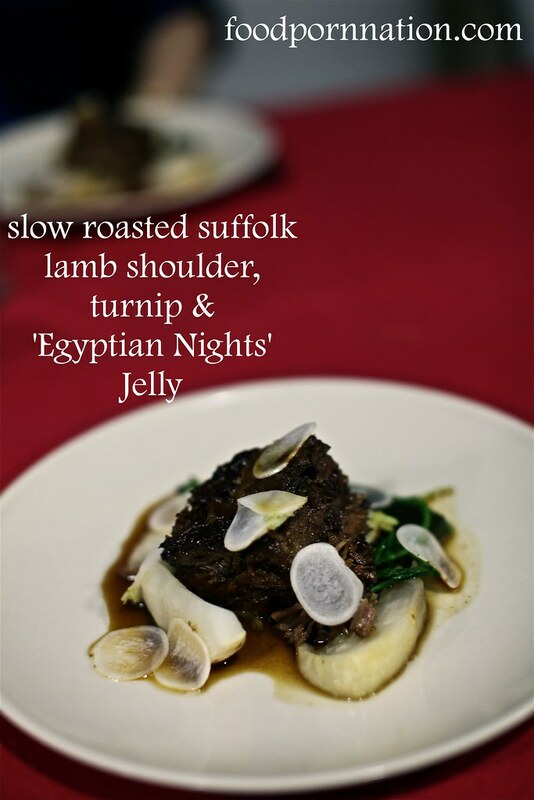 Slow roasted Sufflok lamb shoulder with salt baked turnips, pickled baby turnips, turnip tops and ‘Egyptian Nights’ jelly was next. The lamb was tender and paired well with the jelly which was mint and chamomile. Our next course was a ‘Chai Black’ braised Gloucester Old Spot pork belly with blood orange, burnt leek and shaved carrot was also really tasty. The pork belly was tender and delicious, and the crackling was good and crunchy. 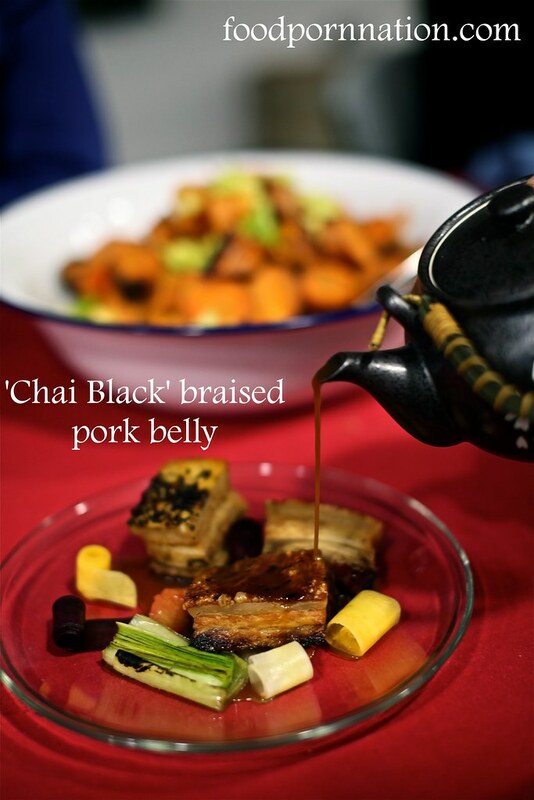 The ‘Chai Black’ (cinnamon, ginger, aniseed, chicory root, cloves, black pepper and Assam black tea) was used to flavour the pork and was a nice touch. We were also served a large side dish of orange roasted carrot salad that ensured none of us went hungry.